What You Get: 4 pack Joiot 16GB USB 3.0 Flash drive, 4 lanyards, 18-month warranty and friendly customer service. Joiot 16GB USB 3.0 Flash Driver Feature: USB 3.0 Super Speed. Swivel thumb and key chain design and fashionable style. Light weight and foldable, easy to carry. Excellent quality, easy to use, no need extra software to drive it,only plug in. Tech Specification: Support PC Mode All brands of Desktop PC, Laptop and others consumer electronic device with USB interface, etc. Support OS Win98/ME/2000/XP/Vista/7/8/10, Mac OS 9.X above and Linux. Support Interface USB version 3.0, 2.0 and 1.1. Capacity 16GB. LED indicator Solid red is power on, blinking red is Data reading or writing. Please Note: 1. 1GB = 1024MB. Some capacity not available for data storage. 2. Approximations:storage capacity results will vary based on file size, resolution, compression, bit rate, content, host device, pre-loaded files and other factors. 3. Actual capacity of 16GB: approximately 14.78GB. 4. 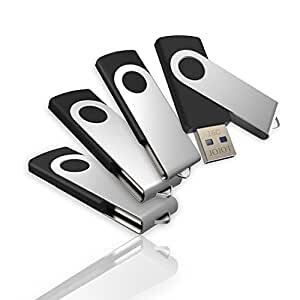 To get best performance for Read / Write speeds, please connect USB 3.0 flash drive to USB 3.0 port. Joiot Warranty: At Joiot, we believe in our products.That’s why we back them all with an 18-month warranty and provide friendly, easy-to-reach support.